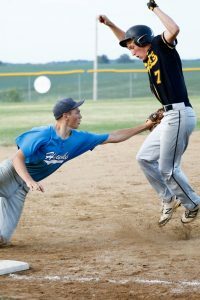 After ending their conference season at 14-2, the Lynnville-Sully baseball boys played in two more non-conference games to ready themselves for postseason play. The Hawks had a difficult go with the Eddyville-Blakesburg-Fremont Rockets on Monday, July 3. They came away with a 6-0 loss. It was a low-scoring affair for the majority of the game with the Hawks going into the seventh inning down 1-0. L-S started to lose defensive control, allowing for five runs in the seventh. The Hawks were unable to bring any runs home, though they were able to load the bases in the sixth. Offensively, they struggled to find hits, ending the night with four. Three of those hits came from senior Tyler Van Zante; the other hit came from senior Caden Dunsbergen. Van Zante was given the loss after pitching 5-1/3 innings, despite his 11 strikeouts. Junior Josh Dunsbergen finished the final 1-2/3 innings, allowing one hit and striking out one. The JV Hawks also played E-B-F and ended with a 2-2 tie due to fireworks that night in Sully. The Hawks had what could have been the winning run on third base, but an E-B-F outfielder made a good throw to gun him down at the plate. Freshman Ethan Wyma scored the two runs for the Hawks. Senior Isaac Collins and freshman Bray Noun Harder both threw for the Hawks. Senior Tyler Van Zante tags out an E-B-F base runner on Monday, July 3. Junior Josh Dunsbergen finds himself in a precarious position after leaping for the ball. The E-B-F runner was called safe. The L-S Hawks hopped on the road to face PCM on Wednesday, July 5. They were unable to hold up against the Mustangs, losing the game 9-5. PCM jumped on them early, scoring five runs in the third inning, two in the fourth, and two in the fifth. At the top of the fifth, the Hawks started to collect some runs. They brought home two in the fifth, one in the sixth, and two in the seventh, not enough to defeat the Mustangs. It was another tough offensive game for L-S, finishing the night with five hits. Van Zante and sopho-more Rylan James both went one-for-three, Van Zante with an RBI. J. Dunsbergen and junior Cody Gibbs went one-for-two, with Gibbs raking in two RBIs. The Hawks were walked six times and did not steal any bases. Junior Elijah Collins took the loss, pitching five innings. Collins only walked one and threw five strikeouts. J. Dunsbergen finished up the final inning, allowing one hit and striking one out. The JV boys had a successful night on the ball diamond at PCM, winning 11-2. The Hawks scored four in the first and never looked back. Noun Harder, Wyma, freshmen Blaize Kuhlmann and Slater Young, and sophomores Abram Collins and Cale Foster added six more runs in the third. Freshman Logan Ingersoll added one more run in the fifth. Kuhlmann pitched a nice game in the win, which brought the JV team’s final record to 14-2-1. The 15-7 L-S varsity team was set to start its postseason play on Tuesday, July 11, traveling to Colfax to play Melcher-Dallas. If the Hawks take the win on Tuesday, they play at Twin Cedars on Thursday, July 13, at 5 p.m. They will face the winner of the July 11 Moravia and Moulton-Udell game. The district final to determine who plays in the substate game will be at Twin Cedars this Saturday at 7 p.m.